President Trump has put the Fourteenth Amendment’s Citizenship Clause in the news. The question is whether the language in the Amendment—“All persons born or naturalized in the United States and subject to the jurisdiction thereof, are citizens of the United States”—provides citizenship to the children of illegal or undocumented aliens who are born in the United States. I have a two-part position on this issue. I believe that the Constitution’s original meaning makes the children of illegal aliens, who are born in the United States, citizens. Since I am an originalist, I would follow this interpretation. But I also believe that a reasonable case can be made—based on nonoriginalism—for not interpreting the Amendment to cover the children of illegal or undocumented aliens. It was a bedrock principle of nineteenth-century international law that sovereigns had complete jurisdiction (that is, authority to prescribe law) over all persons and things within their sovereign territory. This principle was subject to several exceptions, notably (1) territorial jurisdiction did not extend to ambassadors and other diplomatic personnel, nor to foreign rulers and their property, all of whom had immunity from the laws of the territorial sovereign; (2) territorial jurisdiction could be limited by treaty, as the U.S. did to some extent in treaties with Indian tribes; and (3) territorial jurisdiction did not exist as a practical matter over hostile armies and in areas under hostile occupation. U.S.-born children of illegal immigrants do not fit into any of the exceptions to territorial jurisdiction. Nor is there any doubt that such children are governed by U.S. law at the moment of their birth. Thus they are "subject to the jurisdiction" of the United States at birth. As a result, the text's original meaning grants them U.S. citizenship at birth. While agreeing that this was the original meaning, I argued that a nonoriginalist might reasonably disagree. Here let me offer three nonoriginalist arguments that I made for this interpretation—the type of arguments that are typically made by nonoriginalists. First, there are strong nonoriginalist reasons for not following the original meaning as to birthright citizenship for the children of illegal immigrants. At the time of the Fourteenth Amendment, there was not an illegal immigrant issue, since there were essentially no federal laws restricting immigration. Thus, the Framers of the Amendment were unlikely to have had that issue in mind. 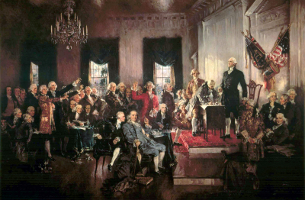 Nonoriginalists typically argue that the decisions made by the Framers are more relevant when they addressed the actual issue and less relevant when they failed to anticipate a matter. Second, there are strong normative arguments against birthright citizenship for illegal aliens (and for many others). Normative arguments are, of course, one of the mainstays of nonoriginalist interpretation. One common argument is that conferring citizenship on the children of illegal aliens obviously provides an incentive for more illegal aliens. A less common argument against conferring citizenship of the children of noncitizen legal residents is that it makes it more difficult to have guest worker programs, since those workers may have children while they are in the United States. But the strongest normative argument against conferring citizenship on the children of illegal aliens derives from the fact that, in the modern world, American citizenship is a tremendous privilege. Given the benefits that U.S. citizenship conveys, the normative question is how we should allocate this privilege. It seems obvious that citizenship should not be granted simply based on the accident of being born in the United States. There are a variety of ways one might want to allocate citizenship (and immigration)—based on quotas from countries, based on skills contributed to the United States, based on years already lived in the United States—but none of those are based on the simple accident of being born in the US. A third type of nonoriginalist argument is to look to the existence of laws throughout the world, especially the developed countries in Europe. A strong trend as to these laws suggests that normatively the United States ought to follow it. Significantly, the only two developed countries in the world that have birthright citizenship are Canada and the United States. None of the European countries have it and several developed nations have repealed it in the last generation. Thus, there is a strong nonoriginalist argument for reading the Fourteenth Amendment not to confer birthright citizenship, at least to the children of illegal or undocumented aliens. Nonoriginalists might not agree with this argument, but it is hard for them to argue that the argument is illegitimate since they accept this type of argument. In the end, one can’t have it both ways. If one favors the freedom that nonoriginalist interpretation gives to an interpreter, then one must live with the way that those who disagree with you would use that interpretive freedom.